If the first few months of this year have been all about finishing things up, the last month has… er not. Now back up to 6 unfinished objects. I have two extra pairs of socks on the needles, both part of Tour de Sock, which I was determined to take part in only as a cheerleader, rather than competing, this year. The stage two pattern was a new technique for me: two colours (which I have done before), but including increases and decreases (this was the new bit). 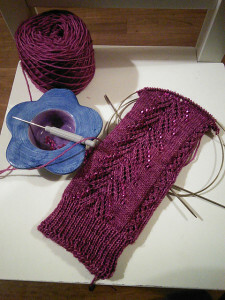 I was knitting along at my usual snail-like pace, with a new target of hoping to finish them before the end of the Tour (beginning of August), when Otilde showed a picture of a possible combination of yarn and beads for stage four. I made a rash, tongue-in-cheek, comment along the lines of that being a terrible combination and she ought to get rid of them in my direction. 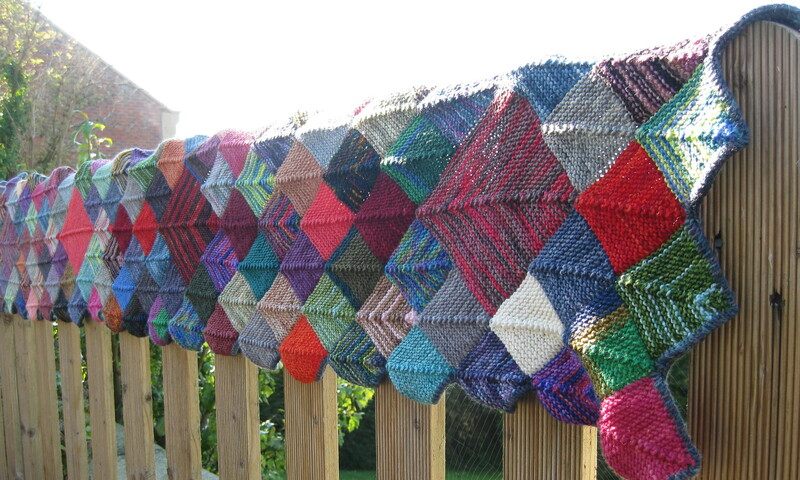 The next thing I know, there is a parcel of yarn and beads on the doormat and I am committed to: “cast on with the rest of us when the pattern comes out, and do your level best to finish it before the deadline”. Day one of the pattern was a day off, so I knuckled down and had this by the end of the day. 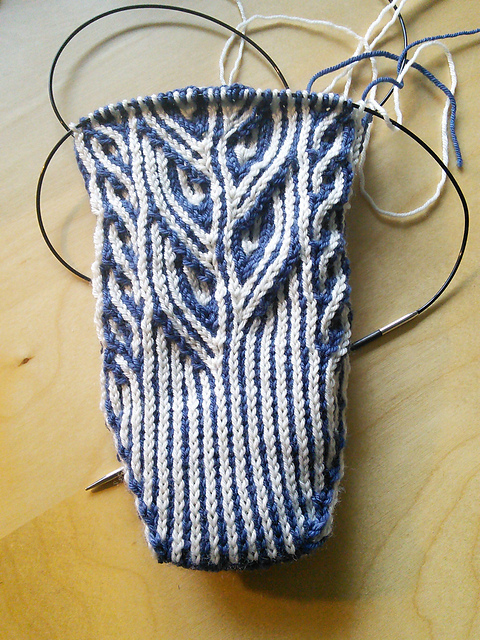 Day two was not so productive, but I now have a heel flap and turn. 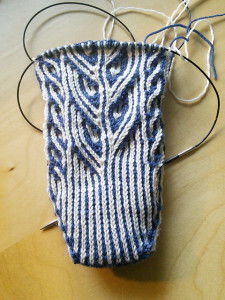 Day three (today) is for casting on the second sock, (and catching up with work). I’ll be happy if I have two or three repeats of the beading done by the end of the day. In other news, the Tour de France begins today, so that means that the Tour de Fleece begins too. The premise: the riders ride, we spin. I’m setting myself a beginner target of spinning for 10 minutes per day every day that the riders are active. I’ve begun to spin some undyed Wensleydale yarn, so that is the first thing to get on with.